Spread hummus over Nori (about 2 to 3 tablespoons), leaving about 1/4 inch off the corner empty. 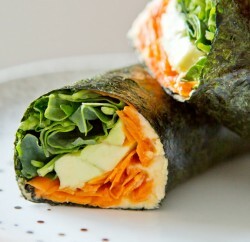 You don’t want the Nori to get too mushy. Pile it all in starting with the lettuce and one vegetable at a time, right in the corner near you and roll it up. Slice wrap with very sharp knife and enjoy!